Mythic Europe is a place of heroism and cowardice, honour and betrayal, wonder and horror. Introduce this full range of possibility into your saga's stories with Tales of Mythic Europe, a collection of short adventures for Ars Magica Fifth Edition. From a ship plagued by a faerie, to a noblewoman plagued by her neighbours. From a village facing a feud, to a town facing unnatural murders. From the godly machinations of churchmen, to the diabolic machinations of demons. 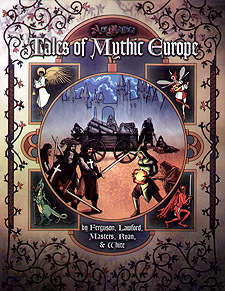 Combat, politics, magic, and mystery fill the stories in Tales of Mythic Europe, to help you reach the furthest limits of Mythic Europe in your own game.